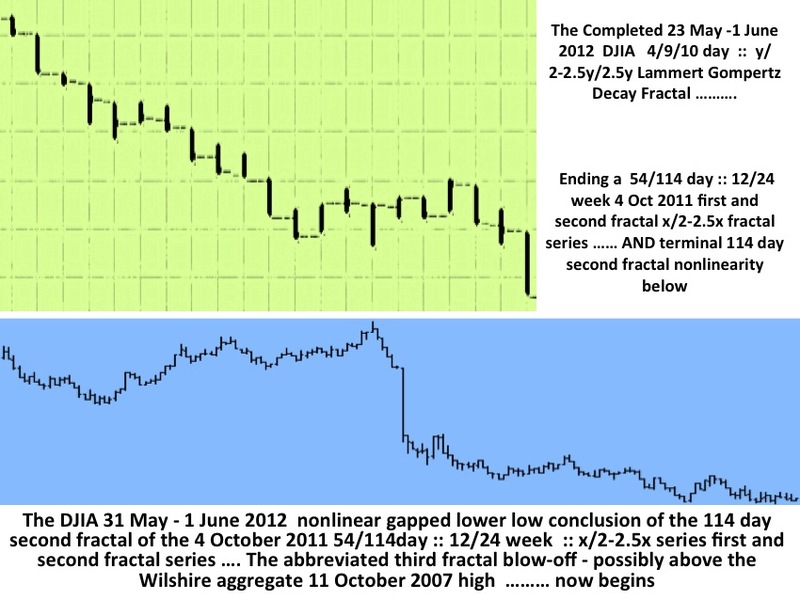 The Nikkei 26 April to 4 June 2012 Gompertz Lammert Decay Fractal of 5/11/11 days :: y/2-2.5y/2-2.5y … clearly shows, on a daily basis, the second fractal characteristic lower low nonlinear daily gap (see the main page of TEF) – ending the 97 day second fractal with a 17 November 2011 7/17/17 day or 39 day base. Japanese debt and countervailing assets are part of the global self assembly debt -asset valuation system. The Nikkei’s valuation is restricted by its relatively proportionally greater parochial debt. 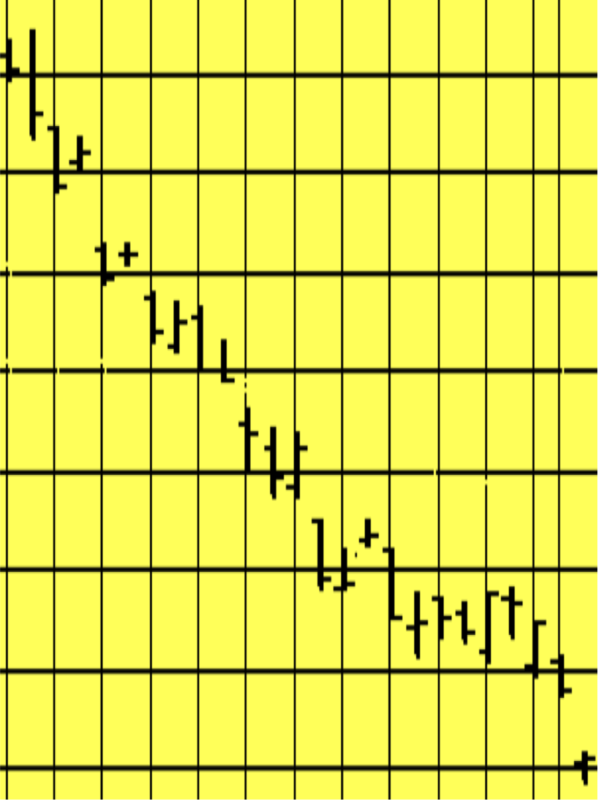 The 4 June 2012 Nikkei second fractal low came within a 1/8 of a percent of its 25 November 2011 first fractal low. What is remarkable about this new patterned mathematical science of countervailing debt-asset self assembly saturation macroeconomics is that the one quadrillion equivalent system in its entirety can be understood with surprising clarity. A sudden nonlinear drop in the last 0.5x time period of the 2.5X is the hallmark of a second cycle and characterizes this most recognizable cycle. After the nonlinear gap drop, the third cycle begins. This means that the second cycle can last anywhere in length from 2x to 2.5x. While that date was not the low, nor did the thirty year note reach a historical low, 230 year historically low rates for the US ten yer note did occur on 30 May 2012 with lower historical rates on 1 June. The debt instrument’s decline in interest percentage (or rise in asset value for previously owned US debt) followed the system’s countervailing equity asset class with a near ideal Wilshire Gompertz-Lammert decay curve of 4/9/10 days :: y/2.5y/2.5y. 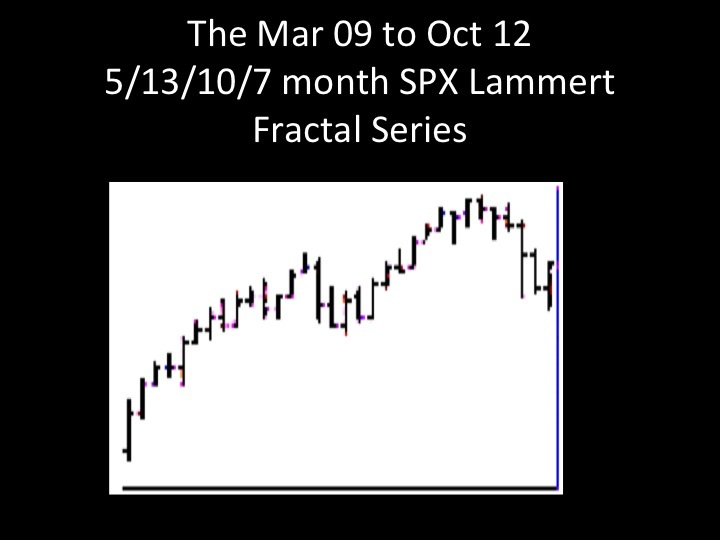 The terminal day of this 4/9/10 day Gompertz decay fractal exactly matched the timing of the Wilshire’s (the global debt-money-asset system’s largest composite equity class and proxy for all of the global system equity classes) 4 October 2011 x/2-2.5x first and second fractal series of 54/114 days and x/2x :; 12/24 weeks with the characteristic second fractal nonlinear gap lower low between 30 May 2012 and 1 June 2012, the 113th and 114th days of the 19 December 2011 114 day second fractal. The system will now proceed to an equity blow-off over the next 11-13 weeks – as money exists the debt instrument money-equivalent pool and enters into the equity money-equivalent pool. This is a global debt-money-asset macroeconomic system. The Wilshire represents the tax favored equity composite of the hegemonic dominate nation and relatively a strong currency as compared to the imploding Euro system and currency and compared to Japan with its high debt/GDP ratio and its representive Nikkei following a weak November 8-9/21 week :: x/2-2.5x fractal series and over 90 percent lower in real terms from its 40,000 high 22 years ago. Global money will flow toward the stronger hegemonic system over the next 11-13 weeks with a possibility of a blow off in the Wilshire above its prospectively predicted 11 October 2007 nominal high. From 1 June 2012 the world can now observe prospectively the global debt-money-asset system’s quantum daily asset valuation fractal progression of its tax-advantaged favored equity class to the system’s US hegemonic equity class 70/155 year :: x/2-2.5x high. Kindly observe the exquisitely elegant final decay pattern on 1 June 2012 ending the second 19 December 2012 114 day second fractal and the 3 May 4/9/10 y/2.5y/2.5y decay fractal.